Best deal if found around at the moment for branded toilet paper. Not much else to say really as it’s just toilet paper. Unfortunately perfumed toilet paper is really bad for a lot of women who are prone to cystitis and/or thrush. I know quite a few people who can’t use Aldi toilet rolls for that reason. I prefer the San Izal toilet paper . Info from the pack purchased on Thursday. Cheaper than Amazon deal recently posted. Lots in stock in Bradley Stoke Bristol. These kind of responses normally elicit a virtual battering. Thankfully, the posters on this thread are quite nice... Just saying. Back on deal again currently £15 and in stock. Last lot I ordered was 2 ply. The changed the product to 2 ply early on last year but kept the price the same. It says £6.50 on mysupermarket.co.uk who I check first when I'm doing an online shop. I didn't notice that it doesn't say that on the supermarkets own sites. The next cheapest I can find it is £6. I don't want to seem to be misleading though so I can alter the post, but I've already re-edited it a few times and don't know if there's a limit to how many times it can be altered. Don't buy these anymore since they changed to 2 ply. Rather sneakily they have the "same deal" but it's on a different brand and not Nikky. Have Farm foods ceased that deal? Same brand in Asda I can see a pack of 16 on offer for £6 fyi. So 37.5p each. Good deal? Until recently, I would have recommended Aldi's Saxon Soft white 2-ply. A 9 roll pack costs just £1.99. We've used it for years and it gets the job done! However, of late, I've noticed that the paper is actually a slightly thicker 1-ply and not proper 2-ply. This deffo isn't a case of 'the layers have separated in the wrong place and you need to fold it over to realign it'. This is definitely 1-ply. 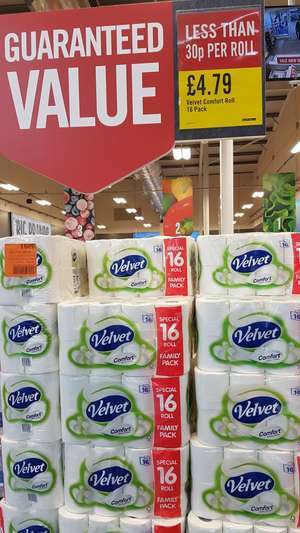 TBH, I'm not sure how a big retailer like Aldi can get away with this because its a blatant case of misleading advertising (it says it's 2-ply on the pack). If you're reading this Aldi, could you please put it back the way it was? We are not a uncivilised, third-world country (yet!). Thank you. so price for non prime , is delivery for free? 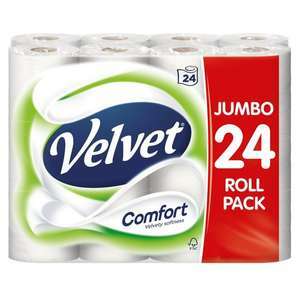 Velvet comfort 9 pack £2.50 until 16th August. Showing as OOS online at time of posting but should have in store. Next best price £4 at Waitrose and Ocado. I shopped around and kind of got a bit annoyed as a lot of the manufacturers seem to lowering the quality and thickness of thier brands, Andrex included. So ended up sticking with Tesco luxury soft quilted. Not the best price but thick and the price remains constant and its in regular supply. They feel twice as thick as the two ply comfort. What toilet rolls do you purchase now ? yeah ive noticed they`ve done a cheeky drop a ply... very naughty. Yeah we Don’t want Hum Dum Dot Finger up Bot.. They just gave me a refund of £1.91 lol. Wasn't sure if u was gonna respond. Really think it depends on who u get. I got prime free for a whole year once, most of the time they give a few quid refund if not nothing. They sent me another pack in addition to the two that I'd bought, so was happy enough with that! Same with me 5x9. What did Amazon say? Wondering if it's worth contacting them. 5x9 arrived here today unfortunately. I've contacted Amazon. To confirm other reports - 2 ply. 2 ply 210 sheets per roll, won't be buying this again. 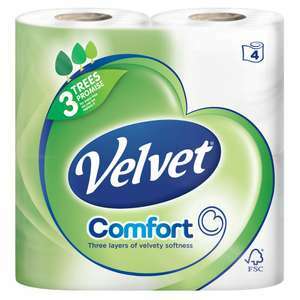 Would rather stick with Costco's Triple Satin in the future (3 ply 240 sheets/roll at £17.89 for 40). Never miss a 'Velvet Comfort' deal again! Did they have any other flavours? I was looking for a v neck. Only issue is my chest hair. ok thank you i want to buy curtains and matching cushions around £100 or more, but i was not sure should i buy from next Dunelm i also find a cream colour in this site Julian Charles. The outer fabric that the cushions are made from is excellent but from my experience ( I bought the creme coloured ones last year that are pictured) they scrimped on the amount of stuffing and they went flat very easily! is the quality good? i want to buy a pair of curtain. Beautiful cushions and covers. Shame none reasonably near me for free CC. Heat! I bought these in the sale a few weeks ago. Very comfy. No over analysis required :D Saw your name crop up lots , and a two second look at your profile shows the rest , honestly thought you couldn't be real with that many deals (lol) ! ...and then use loads of tissue to dry your soaking wet arse and the rest of the toilet area? Guys, please use water to wash your a$$. Dont just rely on a dry peice of paper to clean your a$$. Thats just gross! Many thanks. I'm afraid it is! Must have been old stock. They've switched to 2-ply now. Shrinkflation! I would buy if I got the model with it. "Lick me I've got great taste" That's some weird syntax.